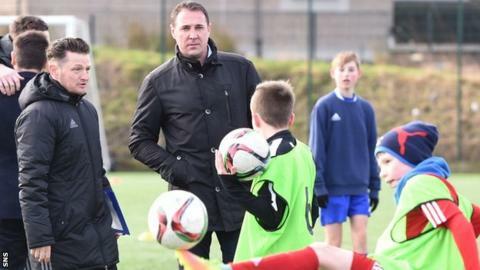 A new Scottish Football Association head of coaching will be appointed in "a week or so", performance director Malky Mackay has confirmed. The new position is being created to mentor the country's most promising young coaches. Mackay hinted that the new man would be an experienced Scots coach. "It is someone I feel that is able to talk to every club, who has experience, well versed in Scottish football," said Mackay, who was appointed in December. "Between him, myself and the Scottish national coaches, we are going to get out to the clubs week on week so that the SFA presence within football clubs becomes the norm. "I have asked 12 clubs so far and I will be getting round as many clubs as I can in the near future, but not one club has said no. "Someone is nearly ready to be appointed and that will be done in the next week or so." The move is part of Mackay's plan, known as Project Brave, to improve the elite level of Scottish football. Amid several new proposals, the 29 current club academies will be reduced to a maximum of 16, the number of academy players will be reduced from 2,500 to 1,200, summer football for young players will be introduced and reserve football will be brought back. "There is no conflict of interest," insisted Mackay. "It is about trying to educate clubs' coaches, look at the best young players that we will hopefully select for Scotland - so there is no downside. "The only downside is that it needs to be done and we need to do it pretty soon. "It is not something that has been done for a while."